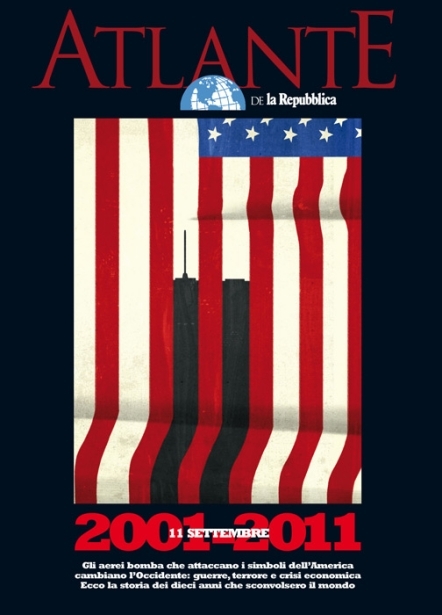 Emiliano Ponzi commemorates the attacks on the World Trade Center with his cover for The Atlas of the Republica, a special edition of La Repubblica newspaper that analyzes the economic and geopolitical consequences of September 11th. Featuring content by La Repubblica’s most prominent journalists, authors, and political experts, the edition spans over two hundred and fifty pages and covers the last decade in world events. The Atlas of the Republic: The Ten Years that Shook the World is currently available at newstands throughout Italy. We are. Citizens of one world. This entry was posted in Altpick, Design, Illustrations and tagged 9/11, commemoration.. Bookmark the permalink.